VANCOUVER, March 19, 2019 /CNW/ - Equinox Gold Corp. (TSX-V: EQX, OTC: EQXFF) ("Equinox Gold" or "the Company") has completed an updated mineral resource estimate for its Aurizona Gold Mine ("Aurizona") in northeastern Brazil and an updated mineral reserve and resource estimate for its Mesquite Gold Mine ("Mesquite") in California, USA, and has filed a new technical report for Mesquite. All dollar amounts are shown in US$. Mineral resources are reported exclusive of mineral reserves. Scott Heffernan, EVP Exploration of Equinox Gold, commented: "The Aurizona resource update captures the success of the 2017-2018 exploration program, demonstrating the potential to both expand the open-pit resource base and develop an underground mine, which could extend production well beyond the current mine life. We are also pleased with the results of the Mesquite technical report and look forward to realizing on optimization and mine life extension opportunities at Mesquite." The updated mineral resource estimate for Aurizona incorporates 13,635 metres ("m") of shallow infill and step-out drilling focused on the western end of the Piaba deposit completed since the July 2017 feasibility study (the "Feasibility Study"). 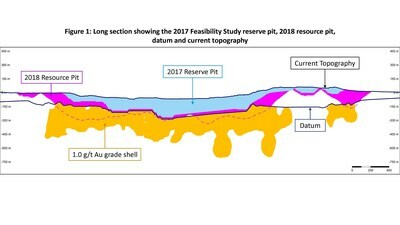 For the resource update, independent open-pit and underground resource models were prepared to provide an improved basis for assessing the underground potential at Aurizona. Results are as follows. The updated resource estimation reflects several improvements and changes in methodology over the 2017 model as outlined below. Independent open-pit and underground resource models were generated using block sizes of 10 m x 5 m x 6 m for the open-pit and 5 m x 5 m x 5 m for the underground and a production scenario using standard open-pit and underground long-hole open-stope mining methods. The underground resource model is informed by an updated geological model consisting of 16 high-grade gold-bearing structures having an average thickness of 3 m to 6 m and coincident with increased veining, sulphide mineralization and grades greater than or equal to 0.7 g/t Au. Optimization parameters are unchanged from the 2017 resource estimate except to update adequate infrastructure setback distances. Notes. Reserves are unchanged from the reserve estimate in the July 2017 feasibility study. The update to the January 5, 2017 resource estimate was completed by Trevor Rabb, P.Geo of Equity Exploration Consultants Ltd. with an effective date of October 22, 2018. Mineral resources are reported using cut-off grades of 0.6 g/t Au for open-pit and 1.0 g/t Au for underground resources. Open-pit mineral resources were constrained by pit shells developed using $1,400/oz gold for Piaba and $1,350/oz for Boa Esperança and a variable elevation datum separating open-pit from underground resources. Underground resources were constrained by using a 1.0 g/t Au confining solid. Mineral resources are reported exclusive of reserves. Mineral resources that are not mineral reserves do not have demonstrated economic viability. There is no certainty that all or any part of a mineral resource will be converted into mineral reserves. Numbers have been rounded to reflect the accuracy of the estimate and may not sum due to rounding. See Cautionary Notes. The open-pit and underground resource models are separated by a datum defined by a surface that is 20 m below the lower of the upper contact of the fresh rock or the base of the Feasibility Study reserve pit. The application of the datum resulted in certain sections of previously classified open-pit resources being reclassified as underground resources, increasing underground Inferred Resources by 562,000 ounces to 1,052,000 ounces and establishing a new underground Indicated Resource of 460,000 ounces. Based on the significant increase to underground resources, the Company is examining the potential of developing an underground mine at Aurizona, either as a sequential project or concurrently with open-pit mining to increase production with higher-grade feed from underground. Not included in the current update is 5,500 m of drilling to the northeast of Piaba, which intersected broad intervals of economic grade gold mineralization, and 1,804 m of drilling at the Tatajuba target, which represents a potential 4-km extension to the Piaba Trend. The Company is planning future drill programs for both of these targets. The increase in M&I Mineral Resources is primarily the result of using a higher gold price ($1,400 from $1,375) in the estimation and including the Rainbow Zone, the eastern extent of the Mesquite mineral resource. The Mesquite economics outlined in the technical report do not include near-term production potential from mineralized dumps and leach pads from historical operations that Equinox Gold is currently testing, as discussed in section 24 of the technical report, or exploration opportunities. Notes. This mineral reserve estimate has an effective date of December 31, 2018 and is based on the Mesquite mineral resource estimate dated December 31, 2018 completed by SIM Geological Inc. The mineral reserve calculation was completed under the supervision of Gordon Zurowski, P.Eng of AGP, who is a Qualified Person as defined under NI 43-101. The mineral reserves and resources were reported in the technical report entitled "Technical Report on the Mesquite Gold Mine, Imperial County, California, U.S.A." with an effective date of December 31, 2018. The reserves for Mesquite are based on the conversion of the Measured and Indicated resources within the current mine plan. Measured Resources are converted to Proven Reserves and Indicated Resources are converted directly to Probable Reserves. Mineral reserves are stated within the final design pit based on a $1,250/oz gold price. The cut-off grade for oxide material is 0.15 g/t and 0.31 g/t for transition and non-oxide material. The mining cost averaged $1.45/t mined, processing costs are $1.81/t ore and G&A was $0.75/t ore placed. The ore recoveries were 75% for oxide, and 35% for transition and non-oxide material. Numbers have been rounded to reflect the accuracy of the estimate and may not sum due to rounding. See Cautionary Notes. Notes. This mineral resource estimate was prepared by Robert Sim P.Geo, SIM Geological Inc. and Bruce Davis, FAusIMM, BD Resource Consulting, Inc. The estimated mineral resources represent the material located between the surveyed topographic surface at December 31, 2018 and the ultimate resource limiting pit shell generated at year-end 2018, excluding any surface stockpiles. Cut-off grade for oxide material is 0.134 g/t Au and 0.288 g/t Au for transition and non-oxide material. Mineral resources are reported exclusive of mineral reserves. Mineral resources that are not mineral reserves do not have demonstrated economic viability. There is no certainty that all or any part of a mineral resource will be converted into mineral reserves. It is expected that a majority of inferred mineral resources could be upgraded to indicated or measured resources with additional exploration. Numbers have been rounded to reflect the accuracy of the estimate and may not sum due to rounding. See Cautionary Notes. Equinox Gold&apos;s consolidated P&P Reserves at December 31, 2018 were 5.5 million ounces, a 470% increase compared to 971,000 ounces at the end of 2017 as a result of the Mesquite acquisition and completion of a prefeasibility study for Castle Mountain. M&I Resources at year-end 2018 were 3.6 million ounces, a 20% decrease compared to 4.4 million ounces at the end of 2017 as a result of the majority of Castle Mountain M&I Resources upgrading to P&P Reserves upon completion of the prefeasibility study. Notes. Numbers have been rounded to reflect the accuracy of the estimate and may not sum due to rounding. See Cautionary Notes and Qualified Person and Technical Disclosure Statement. Notes. Mineral resources are reported exclusive of reserves. Mineral resources that are not mineral reserves do not have demonstrated economic viability. There is no certainty that all or any part of a mineral resource will be converted into mineral reserves. Numbers have been rounded to reflect the accuracy of the estimate and may not sum due to rounding. See Cautionary Notes and Qualified Person and Technical Disclosure Statement. Equinox Gold is a Canadian mining company with a multi-million-ounce gold reserve base, gold production from its Mesquite Gold Mine in California, and near-term production from two past-producing mines in Brazil and California. Commissioning is underway at the Company&apos;s Aurizona Gold Mine in Brazil and the Company is advancing its Castle Mountain Gold Mine in California with the objective of ramping-up Phase 1 operations in early 2020. Further information about Equinox Gold&apos;s portfolio of assets and long-term growth strategy is available at www.equinoxgold.com or by email at ir@equinoxgold.com. Scott Heffernan, M.Sc., P.Geo., the Company&apos;s EVP Exploration and Qualified Person under National Instrument 43-101 ("NI 43-101"), has reviewed and verified that the technical information contained in this news release is accurate and approves the written disclosure of this information. Aurizona: The 2018 Piaba open-pit, Piaba underground and Boa Esperança open-pit resource estimates, with an effective date of October 22, 2018, were prepared by Trevor Rabb, P.Geo (EGBC #39599), B.Sc., who is a "qualified person" within the meaning of NI 43-101. Mr. Rabb is an employee of Equity Exploration Consultants Ltd. and is considered to be "independent" for the purposes of Section 1.5 of NI 43-101. The Aurizona reserve estimate was disclosed in the "Feasibility Study on the Aurizona Gold Mine Project" prepared by Lycopodium Minerals Canada Ltd. with an effective date of July 10, 2017, which is available for download on SEDAR at www.sedar.com. The Mineral Reserve estimate has an effective date of May 29, 2017 and is based on the Mineral Resource estimate dated January 5, 2017 and prepared by SRK Consulting (Canada) Inc. The Mineral reserve calculation was completed under the supervision of Gordon Zurowski, P.Eng of AGP, who is a Qualified Person as defined under NI 43-101. Mineral Reserves are stated within the final design pit based on a $1,056 per ounce gold price pit shell with a $1,200 per ounce gold price for revenue. The cutoff grade was 0.60 g/t Au for the Piaba pit area and 0.41 g/t Au for the Boa Esperança area. The mining cost averaged $2.32/tonne mined, processing averages $11.30/tonne milled and G&A was $2.84/tonne milled. The process recovery averaged 90.3%. The exchange rate assumption applied was R$3.30 equal to US$1.00. Numbers may not sum due to rounding. Mesquite: The Mesquite reserve and resource estimates were disclosed in the technical report entitled "Technical Report on the Mesquite Gold Mine, Imperial County, California, U.S.A." prepared by AGP with an effective date of December 31, 2018, which is available for download on SEDAR at www.sedar.com. The Mesquite resource estimate was prepared by Robert Sim P.Geo, SIM Geological Inc. and Bruce Davis, FAusIMM, BD Resource Consulting, Inc. The Mesquite reserve estimate was based on the Mesquite mineral resource estimate prepared by SIM Geological Inc. The mineral reserve calculation was completed under the supervision of Gordon Zurowski, P.Eng of AGP, who is a Qualified Person as defined under NI 43-101. The estimated mineral resources represent the material located between the surveyed topographic surface at December 31, 2018 and the ultimate resource limiting pit shell generated at year-end 2018, excluding any surface stockpiles, and are reported exclusive of mineral reserves. Cut-off grade for oxide material is 0.134 g/t Au and 0.288 g/t Au for transition and non-oxide material. The reserves for Mesquite are based on the conversion of the Measured and Indicated resources within the current mine plan. Measured Resources are converted to Proven Reserves and Indicated Resources are converted directly to Probable Reserves. Mineral reserves are stated within the final design pit based on a $1,250/oz gold price. The cut-off grade for oxide material is 0.15 g/t and 0.31 g/t for transition and non-oxide material. The mining cost averaged $1.45/t mined, processing costs are $1.81/t ore and G&A was $0.75/t ore placed. The ore recoveries were 75% for oxide, and 35% for transition and non-oxide material. Numbers may not sum due to rounding. Castle Mountain: The Castle Mountain Mineral Reserve and Mineral Resource Estimates were disclosed in the "NI 43-101 Technical Report on the Preliminary Feasibility Study for the Castle Mountain Project" prepared by Kappes, Cassiday and Associates with an effective date of July 16, 2018, which is available for download on SEDAR at www.sedar.com. The Mineral Reserve estimate with an effective date of June 29, 2018 is based on the Mineral Resource estimate with an effective date of March 29, 2018 that was prepared by Don Tschabrun, SME RM of Mine Technical Services. The Mineral Reserve was estimated by Global Resource Engineering, LLC with supervision by Terre Lane, MMSA, SME RM. Mineral Reserves are estimated within the final designed pit which is based on the $850/oz pit shell with a gold price of $1,250/oz. The minimum cut-off grade was 0.14 g/t gold and 0.17 g/t gold for Phases 1 and 2, respectively. Average life of mine costs are $1.39/tonne mining, $2.11/tonne processing, and $0.80/tonne processed G&A. The average process recovery was 72.4% for ROM and 94% for Mill/CIL. The Mineral Resource is based on a gold cut-off grade of 0.17 g/t. The Mineral Resource is contained within an LG shell limit using a $1,400 gold price as well as cost and recovery parameters presented in the technical report. Numbers may not sum due to rounding. Elk Gold: The Elk Gold Mineral Resource estimate has an effective date of August 22, 2016 as reported in the "Technical Report on Resources of the Elk Gold Project" completed by Robert Wilson, P.Geo., Gary Giroux, P.Eng. and Antonio Loschiavo, P.Eng. with an effective date of August 22, 2016. The Mineral Resource calculation was completed under the supervision of Gary Giroux, P.Eng., who is a Qualified Person as defined under NI 43-101. The constrained resource was calculated using a gold price of US$1232/oz. Open-pit resources are reported at a 1.0 g/t gold cut-off grade and potential underground resources are reported at a 5.0 g/t cut-off grade. The grade reported is the average grade of the resource both in and underground. Numbers may not sum due to rounding. Information regarding reserve and resource estimates has been prepared in accordance with Canadian standards under applicable Canadian securities laws and may not be comparable to similar information for United States companies. The terms "Mineral Resource", "Measured Mineral Resource", "Indicated Mineral Resource" and "Inferred Mineral Resource" used in this news release are Canadian mining terms as defined in accordance with NI 43-101 under guidelines set out in the Canadian Institute of Mining, Metallurgy and Petroleum ("CIM") Standards on Mineral Resources and Mineral Reserves adopted by the CIM Council on May 10, 2014. While the terms "Mineral Resource", "Measured Mineral Resource", "Indicated Mineral Resource" and "Inferred Mineral Resource" are recognized and required by Canadian regulations, they are not defined terms under standards of the United States Securities and Exchange Commission. Under United States standards, mineralization may not be classified as a "reserve" unless the determination has been made that the mineralization could be economically and legally produced or extracted at the time the reserve calculation is made. As such, certain information contained in this news release concerning descriptions of mineralization and resources under Canadian standards is not comparable to similar information made public by United States companies subject to the reporting and disclosure requirements of the United States Securities and Exchange Commission. An "Inferred Mineral Resource" has a great amount of uncertainty as to its existence and as to its economic and legal feasibility. It cannot be assumed that all or any part of an "Inferred Mineral Resource" will ever be upgraded to a higher category. Under Canadian rules, estimates of Inferred Mineral Resources may not form the basis of feasibility or other economic studies. Readers are cautioned not to assume that all or any part of Measured or Indicated Resources will ever be converted into Mineral Reserves. Readers are also cautioned not to assume that all or any part of an "Inferred Mineral Resource" exists or is economically or legally mineable. In addition, the definitions of "Proven Mineral Reserves" and "Probable Mineral Reserves" under CIM standards differ in certain respects from the standards of the United States Securities and Exchange Commission. This news release contains certain forward-looking information and forward-looking statements within the meaning of applicable securities legislation and may include future-oriented financial information. All statements, other than statements of historical fact, are forward-looking statements. Forward-looking statements or information in this news release relate to, among other things: the ability of the Company to successfully complete construction and commissioning activities and the planned restart of production at Aurizona; the ability of the Company to successfully operate Mesquite, including with respect to production; development and timing of anticipated production at Castle Mountain; and the growth potential of the Company. Forward-looking statements or information generally identified by the use of the words "will", "advancing", "planned", "anticipated", "expected", "estimated", "continue", "near-term", "ramping-up" and similar expressions and phrases or statements that certain actions, events or results "may", "should", or "be achieved", or the negative connotation of such terms, are intended to identify forward-looking statements and information. Although the Company believes that the expectations reflected in such forward-looking statements and information are reasonable, undue reliance should not be placed on forward-looking statements since the Company can give no assurance that such expectations will prove to be correct. The Company has based these forward-looking statements and information on the Company&apos;s current expectations and projections about future events and these assumptions include: tonnage of ore to be mined and processed; ore grades and recoveries; prices for gold remaining as estimated; the construction and planned production at Aurizona and Castle Mountain being completed and performed in accordance with current expectations; currency exchange rates remaining as estimated; availability of funds for the Company&apos;s projects and future cash requirements; capital, decommissioning and reclamation estimates; the Company&apos;s mineral reserve and resource estimates and the assumptions on which they are based; prices for energy inputs, labour, materials, supplies and services; no labour-related disruptions and no unplanned delays or interruptions in scheduled development and production; all necessary permits, licenses and regulatory approvals are received in a timely manner; and the Company&apos;s ability to comply with environmental, health and safety laws. While the Company considers these assumptions to be reasonable based on information currently available, they may prove to be incorrect. Readers are cautioned not to put undue reliance on the forward-looking statements or information contained in this news release. The Company cautions that forward-looking statements and information involve known and unknown risks, uncertainties and other factors that may cause actual results and developments to differ materially from those expressed or implied by such forward-looking statements or information contained in this news release and the Company has made assumptions and estimates based on or related to many of these factors. Such factors include, without limitation: fluctuations in gold prices; fluctuations in prices for energy inputs, labour, materials, supplies and services; fluctuations in currency markets; operational risks and hazards inherent with the business of mining (including environmental accidents and hazards, industrial accidents, equipment breakdown, usual or unexpected geological or structural formations, cave-ins, flooding and severe weather); inadequate insurance, or inability to obtain insurance to cover these risks and hazards; employee relations; relationships with, and claims by, local communities and indigenous populations; the Company&apos;s ability to obtain all necessary permits, licenses and regulatory approvals in a timely manner; changes in laws, regulations and government practices, including environmental, export and import laws and regulations; legal restrictions relating to mining; risks relating to expropriation; increased competition in the mining industry; and those factors identified in the Company&apos;s management information circular dated June 20, 2018 and in its MD&A dated December 31, 2018, which are available on SEDAR at www.sedar.com. Forward-looking statements and information are designed to help readers understand management&apos;s views as of that time with respect to future events and speak only as of the date they are made. Except as required by applicable law, the Company assumes no obligation and does not intend to update or to publicly announce the results of any change to any forward-looking statement or information contained or incorporated by reference to reflect actual results, future events or developments, changes in assumptions or changes in other factors affecting the forward-looking statements and information. If the Company updates any one or more forward-looking statements, no inference should be drawn that the Company will make additional updates with respect to those or other forward-looking statements. All forward-looking statements and information contained in this news release are expressly qualified in their entirety by this cautionary statement.